The scrupulous and the just, the noble, humane, and devoted natures; the unselfish and the intelligent may begin a movement---but it passes away from them. They are not the leaders of a revolution. They are its victims. 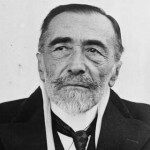 Comments on: "Joseph Conrad Quotes: The scrupulous and the just, the noble, humane, and devoted natures; the unselfish..."